You do not always need a mounting medium to make permanent slides. Dry mounts are slides, in which the specimen is surrounded by air. 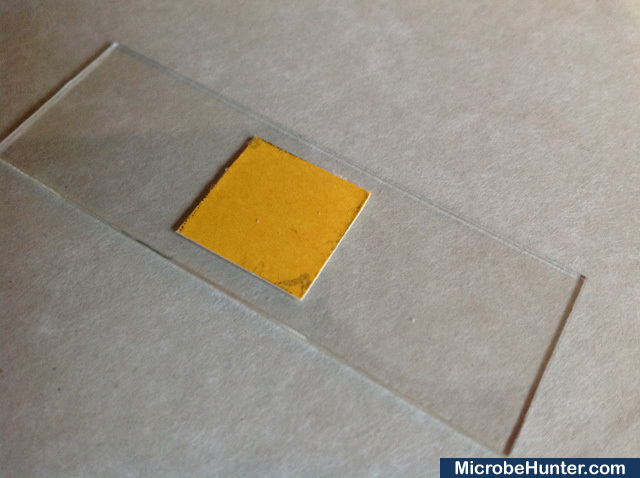 It is quite easy to make dry-mounted slides and therefore it is also a worthwhile beginner’s activity and useful for educational purposes in schools. It is also relatively safe, because you do not need any mounting media which contain (possibly harmful) solvents. A possible disadvantage is the lower image quality that is produced. The presence of a mounting medium is generally necessary, if you want to obtain the best resolution with your microscope. Especially high numerical aperture objectives require the presence of a mounting medium and cover glass to produce the best resolution. Under certain circumstances it it also possible to observe the specimens without mounting medium at all. Dry-mounted slides can be observed with low power objectives, which work at low numerical apertures. With these objectives the loss of image quality is not as high. For making dry mounts, you can either use double sided adhesive tape or cut regular adhesive tape into thin strips to hold the cover glass in place. Using double sided adhesive tape has the advantage in that the tape itself acts as a spacer between the slide and the cover glass. 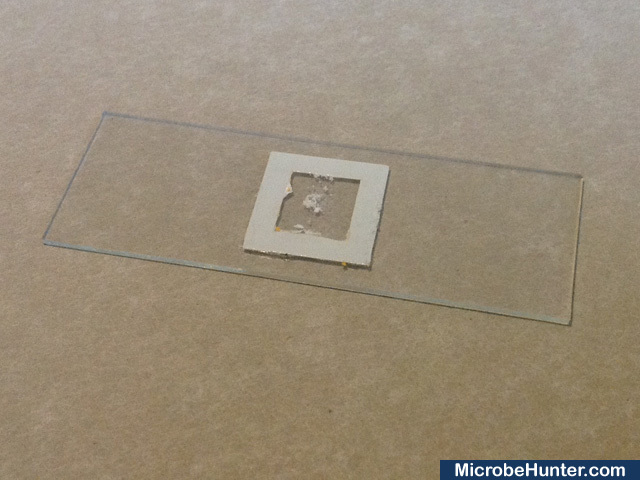 This prevents the specimen from being crushed by the cover glass. The double sided tape is quite strong and therefore a misplaced cover glass will be very difficult to remove and there is the danger of the cover glass of cracking and the danger of injury. The pictures below show a method of using double sided tape, which I found to work quite well. 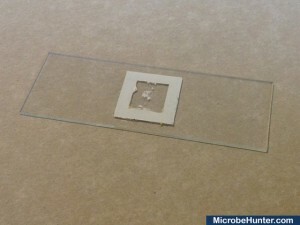 It is also possible to seal the cover glass and stick it to the slide using clear nail polish or glue, but there is the possibility for these liquids to be drawn under the cover glass. For this reason the sealant should be quite viscous. 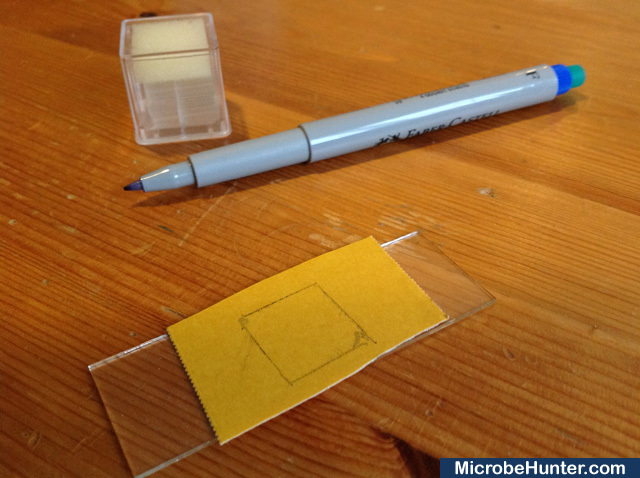 Stick the double sided tape to the slide and trace the shape of the cover glass. Trim the tape with a sharp knife. 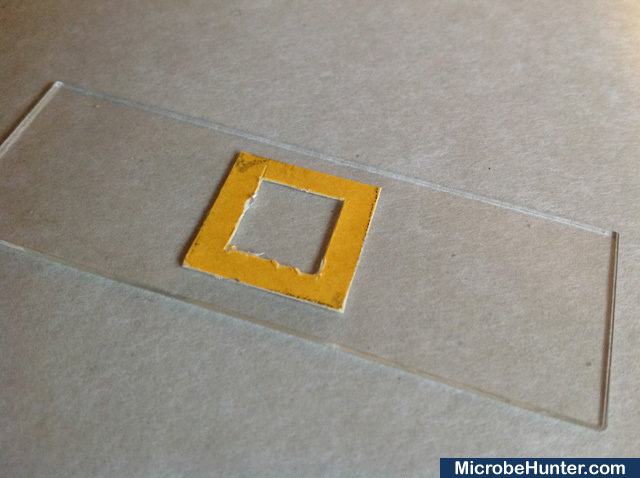 Cut away the inside of the tape to make space for the specimen. The double sided tape holds the cover glass. The sample (powdered sugar) can be seen as well. I can not see any water organisms! What am I doing wrong? Why should you never touch the bulb of a microscope lamp?